The HealthE7 Model outlines seven pillars related to health and functioning for individuals with complex forms of autism and other disabilities. This complexity typically includes co-occurring biomedical conditions and problems such as sleep disorders, gastrointestinal problems including constipation and gastroesophageal reflux disorder, seizure disorders, obesity and Type 2 diabetes, immune and metabolic problems, anxiety, and other psychiatric conditions, all of which exacerbate stress. 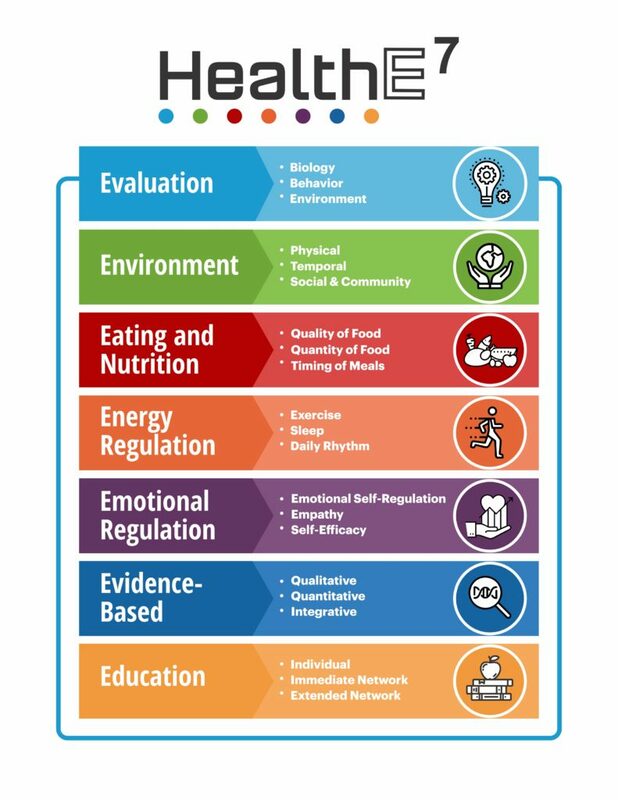 The dimensions outlined in the HealthE7 can be regulated as a foundational intervention to optimize health, functioning, and learning. When these dimensions are properly regulated, individuals will experience less stress on their body and brain resulting in decreased maladaptive behaviors and increased focus, attention, and positive interaction. Evaluation is an evidence-based, comprehensive body and brain approach that is focused on improving health and functioning in three dimensions that have major risk factors in complex conditions including: biology, behavior and environment. The risk factors in these dimensions are not only highly prevalent in autism and other complex conditions, but they contribute significantly to morbidity and mortality for these individuals. During the initial and ongoing evaluation periods, each risk factor is carefully assessed by expert physicians, clinicians, and program teams to develop an integrated treatment plan to support and treat areas of risk. Together, our programs focus on addressing all seven dimensions as a foundational intervention to optimize health, functioning, and learning. Environment includes the physical, temporal, and social dimensions, which can be regulated to help an individual be more successful. The physical environment includes the built environment and natural landscapes, which are intentionally designed to reduce stress and promote learning and socialization. The temporal environment includes the carefully planned activities and timing of events that occur throughout the day and seasons of the year. The social environment is characterized by the people an individual interacts with during the day, with an emphasis on building friendships and learning to interact with classmates and housemates. The social environment extends into the community as individuals are taught skills necessary for community living. Eating and Nutrition are considered critical components of the program at The Center as the quality and quantity of what an individual eats are important to their health, vitality, sleep, and ability to learn and manage stress. What a person eats and how they digest their food affects how they think and perform. At The Center, individuals enjoy a mostly plant-based wholefoods, organically and biodynamically grown diet. Most of the foods are grown on site or sourced locally to ensure quality. Many individuals participate in the activities of the farm, and learn how to cook simple, healthy meals as part of the curriculum. Registered dietitians monitor each individual’s diet to ensure they are receiving proper nutrition as appropriate for their age and individual need. If an individual is a highly selective eater, The Center has developed a program called Food Exploration and Discovery (FED) to help them learn to eat a more robust diet. Individuals who are unable to eat and require a gastrostomy feeding are monitored closely by The Center’s medical team to ensure proper nutrition. Energy Regulation includes physical activity, sleep and daily routines that are designed to regulate the body and brain to improve health, functioning and learning. Each individual is prescribed a daily dose of vigorous exercise and is given a visually sequenced schedule of his/her activities in an effort to reduce stress on the body and brain. Knowing what is expected of you during the day reduces stress and anxiety. Exercise is also well established as a method to improve health, sleep, attention, motivation, and at the same time, it helps to decrease maladaptive behavior and anxiety. A program called the ENERGym has been developed at The Center for individuals to engage in meaningful exercise programs throughout the four seasons. Sleep is extremely important for people of all ages, and staff is trained to help promote sleep through various activities that occur prior to bedtime. Emotional Self-Regulation is the ability to adjust to both negative and positive emotions based on experiences, and is a critical skill for people enrolled in the program. Emotional self-regulation is very complex because in order to control your emotions you need to be able to hold back temper, and/or rev up your emotions at will. All people need to learn to control their internal body and brain states in response to a variety of situations. At The Center, individuals are taught this skill through the creative arts including music, drama, plays, and through programs such as yoga and progressive muscle relaxation. The Center for Discovery utilizes the Zones of Regulation program as well as other curriculums to teach students how to better understand their emotions and those of others, and to employ coping skills when needed. The ability to be in nature, which is integral to The Center’s program, also helps individuals learn emotional regulation. The other two pillars, Evidence-Based and Education, underpin each of the other components. Everything we do at The Center is evidence-based and data-driven, and we systematically track the core programmatic elements and experiences of each individual over time. Our focus on applied informatics, cutting-edge technologies, and predictive analytics is helping us provide answers to caregivers and individuals in real-time and continually inform interventions. In addition, we are committed to collaborating with a broad network of researchers, care providers, philanthropic partners, and key partners within our community, and around the world, to educate others about this comprehensive model of care and advance the understanding of complex conditions.